In 2018 Clear Roads continued a multi-year project to systematically gather, compile and analyze a range of data from state DOTs related to their winter operations. All state DOTs were invited to participate in a survey to collect information about their winter resources, materials and costs for the winter season from July 1, 2017 to June 30, 2018. This complemented data previously collected from the 2014-2015, 2015-2016 and 2016-2017 winters. The results of this survey are linked below. Clear Roads plans to continue conducting this survey into the future, compiling multiple seasons of data. Survey results for upcoming winters will be added to this page once each year’s data analysis is completed. This project was featured in an article in the September 2016 issue of Roads & Bridges magazine. Tab 1. Interactive Map. On this tab users may graphically display one or two survey metrics on a map of the United States using interactive boxes. Tab 2. Collected Data. This tab compiles all data from this year’s and previous years’ survey; it will compile all future-year surveys as well. Tab 3. Calculated Statistics. This tab includes additional derived statistics from this year’s and previous years’ data sets (such as the ratio of full-time workers to part-time workers and the total dry chemicals applied per lane mile). Tab 4. Average Values. This tab presents running averages across the four years of the survey. Tab 5. Changes in Value. This tab presents increases or decreases across the most recent two years of the survey. Tab 6. Reference – Winter Weather. 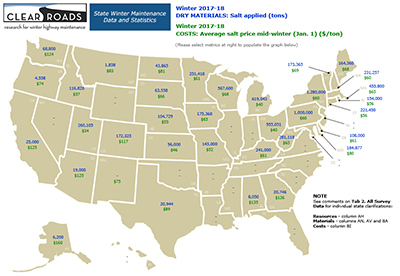 To provide additional context for the data provided by state DOTs in this survey, this tab includes maps developed through Clear Roads research that show average annual winter weather and severity for the decade of 2000 to 2010. Tab 7. User-Generated Map. This tab allows users to display custom data on a map of the United States by pasting it into a table of states.